The Capitol was buzzing yesterday as the 84th Legislature kicked off with the swearing in of members of the House and Senate. Speaker Joe Straus was re-elected for a fourth term as Speaker of the House and Sen. Juan “Chuy” Hinojosa was elected president pro tempore, the person who fills in when the Lieutenant Governor is away. Governor-Elect Greg Abbott and Lieutenant Governor-Elect Dan Patrick will take the oath of office on the south steps of the Capitol at 11am on Inaugural Day, January 20th. For more information on inaugural festivities, click here. Comptroller Glenn Hegar released his biennial revenue estimate this week. There will be a $7.5 billion surplus at the end of this biennium, increasing the amount available for general purpose spending to $113 billion for 2016-2017. The Legislature must not exceed $113 billion in available revenue when writing the budget. Tuesday’s special election for House District 13 to fill the unexpired term of Lois Kolkhorst, who was elected to the Texas Senate, is headed to a run-off. Austin County Judge Carolyn Bilski (R) received 43.45% of the vote and Caldwell attorney Leighton Schubert (R) received 32.79% of the vote. A date for the run-off election has not been announced yet. 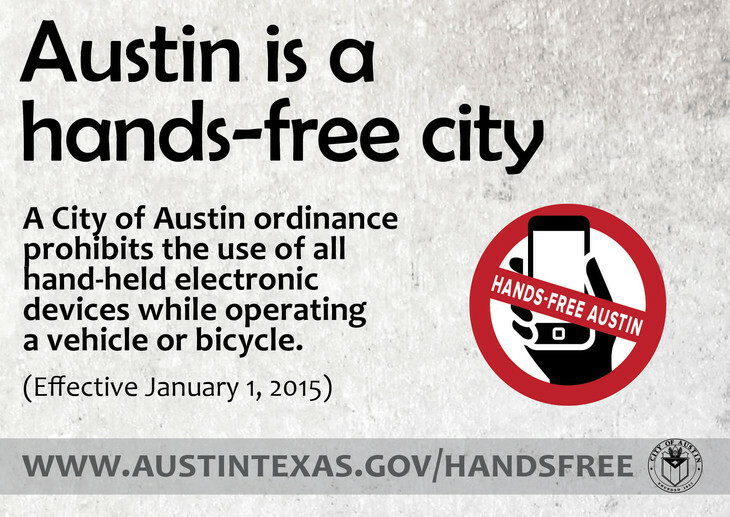 Austin’s city ordinance prohibiting the use of all electronic hand-held devices while driving went into effect January 1, 2015. 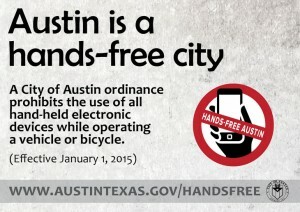 If you are driving in Austin, don’t forget to go hands-free with your cell phone. You could be fined up to $500 if you don’t!